Miriam Halahmy is without compare when it comes to creating vignettes of her world - her family life, friends, work and travels - finely textured emotional and physical landscapes. Drawing on her Jewish roots, she brings a generous heart and searching spirit to her place in that world. She has a passion for pomegranates which she shares with her brother-in-law Oded Halahmy, whose dynamic pieces illustrate several poems. The pomegranate is an ancient and universal symbol of beauty, love and marriage, fertility and renewal. 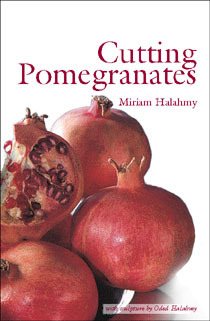 Miriam's poetry is as rich and abundant in its imagery as the pomegranate itself. It is full of hope and vibrant expectation but always tinged with a bittersweet sense of the real. £7.99 plus postage of £1= UK, £2= Euro, £3=rest of the world. In his place under palm trees he sings with his hands dances before wood creates space, balances thought, casts desire. Copyright © 2002 Miriam Halahmy.